But it’s Friday, the end of yet another work week and just about time to relax and start the weekend. Of course you know that also means it’s Guest Post Friday……Woo hoo! Today my friends it’s my great pleasure to share my blog with my friend Amy from Amy’s Cooking Adventures, and has she cooked up the perfect summer treat for us today! If you’ve never visited with Amy before, the name of her blog, Cooking Adventures is right on the mark, as she leads you through some great tasting adventures! 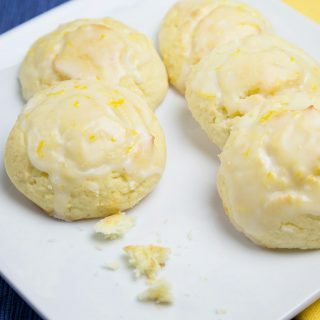 You’ll find all sorts of amazing creations at Amy’s Cooking Adventures, where she delights her readers with everything from cheese enchiladas to potato chip cookies, one delicious post after another! You’re going to love what you see on her pages, but I’m warning you now, you better have some snacks ready because you’re going to be hungry after checking out her posts……I can feel my stomach rumbling just thinking of all those tasty treats! So sit back, relax, put your feet up and let the drooling begin, as I give you ………..
Hello everyone! I’m Amy from Amy’s Cooking Adventures! I’m a Stay at Home Mommy of two sweet little boys with a little bit of Zumba instructing and a whole lot of cooking on the side! Funny story. Just a couple weeks ago I was working up the nerve to ask Chef Dennis if I might be able to guest post on his blog. I had the e-mail typed and then my shyness won out and I deleted the whole thing. Then just two days later (no exaggeration! ), much to my surprise, I had a message in my inbox from Chef Dennis inviting me to post here today! Too funny! I guess great minds think alike! When it came time to choose a recipe, I thought, why not choose something that is quintessentially summer: S’mores! These lovelies are a brownies mix base with graham crackers and more chocolate stuffed inside. Then a marshmallow is toasted on top while they finish baking and topped off with a Kiss! Did I mention that the chocolate is my favorite part of a s’more? 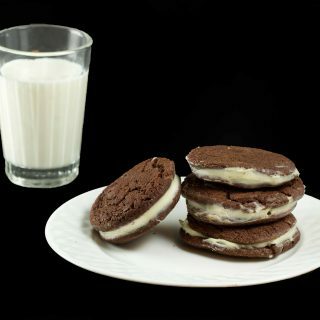 Enjoy these cookies with a big ‘ol glass of milk and imagine you’re sitting by a campfire! Thank you so much Chef Dennis for having me here today! It’s been a pleasure! In a mixing bowl, stir together the brownie mix, eggs, oil, and salt until well combined. The mixture will be quite thick. Fold in the graham cracker pieces and mini Hershey kisses. Scoop about 1-2 tablespoons of dough onto the prepared cookie sheets, about 2 inches apart. Place the cookies, one tray at a time, in the oven to bake. Bake for 6-8 minutes or until the edges are set, but the middle is a bit underdone (it will finish cooking under the broiler). Turn the oven to broil and place 1 marshmallow into the center of each cookie. Broil on a lower rack for 1-2 minutes (watching carefully) until the marshmallows are lightly browned. **Warning: Parchment paper is not meant to go under the broiler. Either move the cookies onto an unlined baking sheet or use extreme caution while broiling. Once the marshmallows are lightly browned, press one Hershey Kiss into each marshmallow and move to wire racks to cool. Continue baking the remaining cookies. 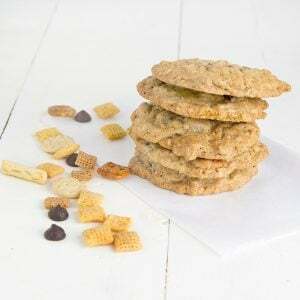 What a perfect summertime treat, S’mores bring back so many memories, and having them made into cookies just makes them so much easier to eat! 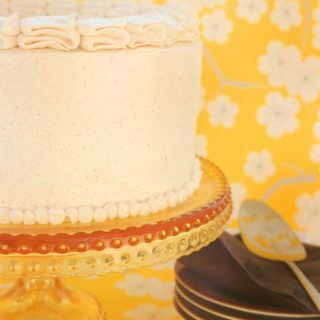 Thanks for such a delicious guest post Amy! Now before you forget head on over to Amy’s Cooking Adventures and say hello, you’ll be so happy you did! Just remember to give youself enough time to drool over all of the wonderful creations you’ll find there! One more thing before you go, Erin from Dinners, Dishes and Desserts is hosting a Bake Sale and over 40 bloggers have come together to help. Click on the Badge on my sidebar for more information about the sale that starts on Sunday July 8th. All proceeds will go to the Colorado Disaster Relief Fund c/o the Red Cross. You will be able to find my Insanely Delicious Triple Chocolate Brownies there. Have a Great weekend my friends , stay cool, stay full and please stay hydrated! My daughter and I made these as our last big hurrah for the end of summer and beginning of the school year. We had a big bonfire cook out and had these as dessert. They were amazing!! I loved the idea of them as a cookie. All the yumminess without all the mess. They would make great bake sale take alongs. I will have to remember that. Thanks for the recipe! Beautiful! My kids are all about s’mores and would devour this cookies! I think this s’mores cookie is one of the best I’ve seen yet. Thanks for sharing! This is outstanding! These make me want to go camping. Yum! These look simply wonderful! What a neat story! 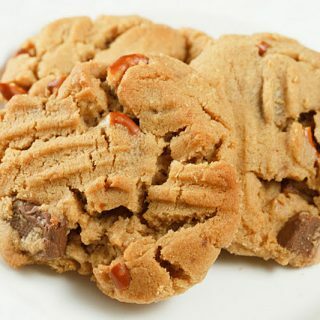 Love when things work out the way we want them too =) These s’mores cookies will definitely be made in our house soon! 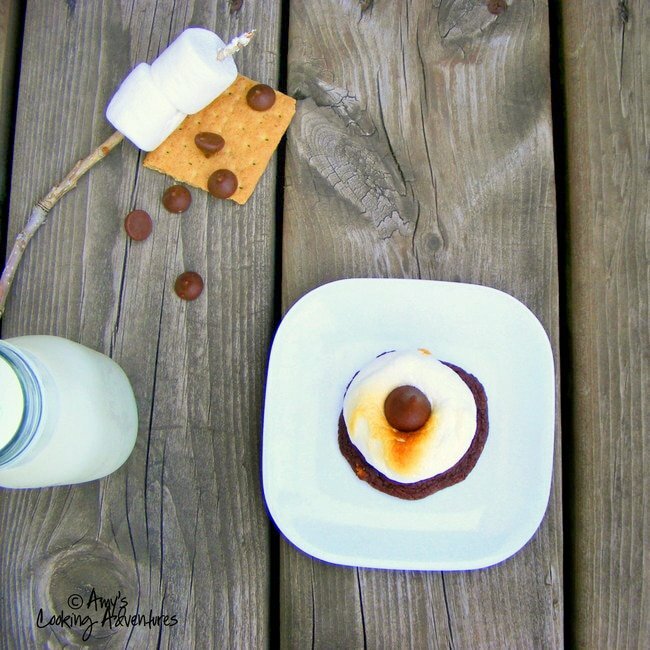 I love the addition of sea salt to these… S’mores done one better… chocolate-y, sweet, AND a little bit salty! Thanks for a delicious guest post, Amy, and thanks Chef Dennis for featuring Amy’s Cooking Adventures. That last photo is summer fun at its finest! Whoa! How did I miss these ? I thought I had left a comment already, turns out, I did not. Anyway, these are insane ~ they are absolutely divine! Just mention “chocolate” and I’m in ! Thanks for the guest post and sharing a great recipe! Good thing chef Dennis allow you to post these one, this is just so perfect for our upcoming event for my kid, and another one why i love these recipe because of those hershey kisses, I just so love them, no wonder for this event no more kisses left for the s’mores. Thank you so much for the opportunity, Chef Dennis! I remember making these at Girl Scouts and sitting around a campfire. I don’t think I have had one since then and we are talking a lot of years ago. It’s nice to meet you Amy and these S’mores look fantastic. 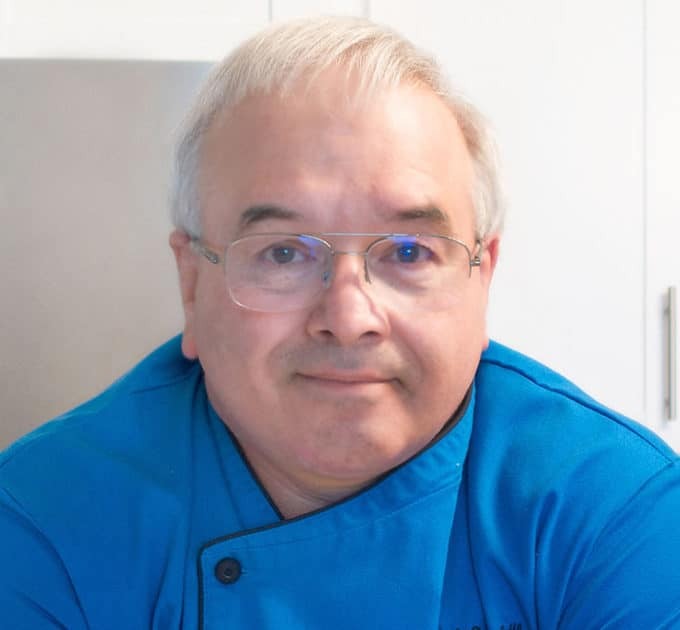 Lovely guest post Chef and a wonderful weekend to you both. 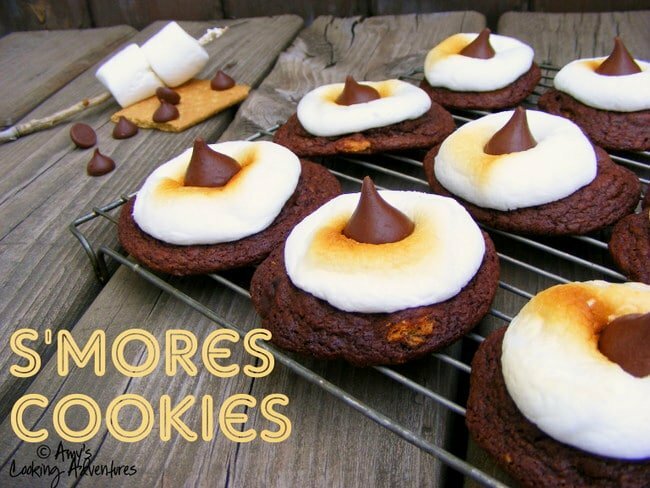 I love s’mores, what a fun idea to turn them into these cookies. Perfect for summer! Hi Amy and Chef. I guess this guest post was meant to be since you guys thought about it at the same time! And I’m so glad you did. Dudette would LOVE these cookies. She asks me for s’mores all the time, but with it as hot here as it is elsewhere (yeah, I feel your pain, Chef), there’s no way I’m sitting around a fire with a marshmallow on a stick. This recipe removes that need! Thanks for creating it and sharing it, Amy. I love it when serendipitous things happen – this guest post was meant to be! 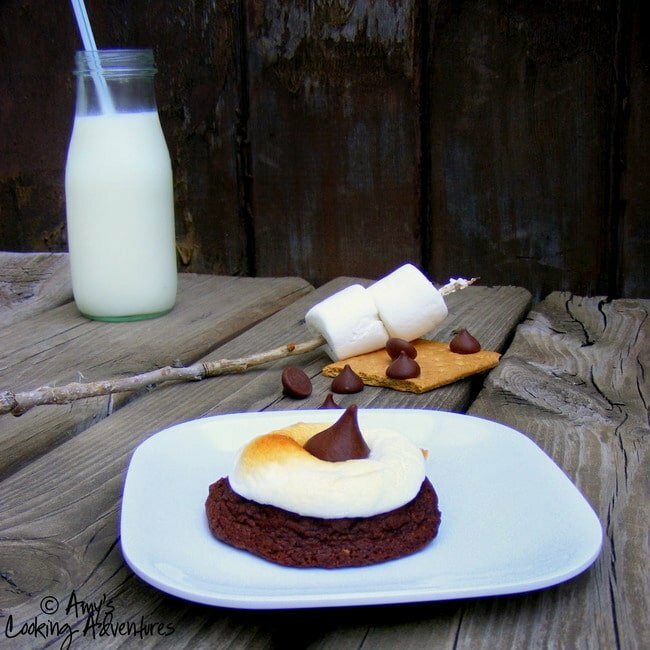 I love the idea of s’mores cookies – perfect for a backyard potluck!